Citation Information: J Clin Invest. 2018;128(7):3186-3197. https://doi.org/10.1172/JCI98931. 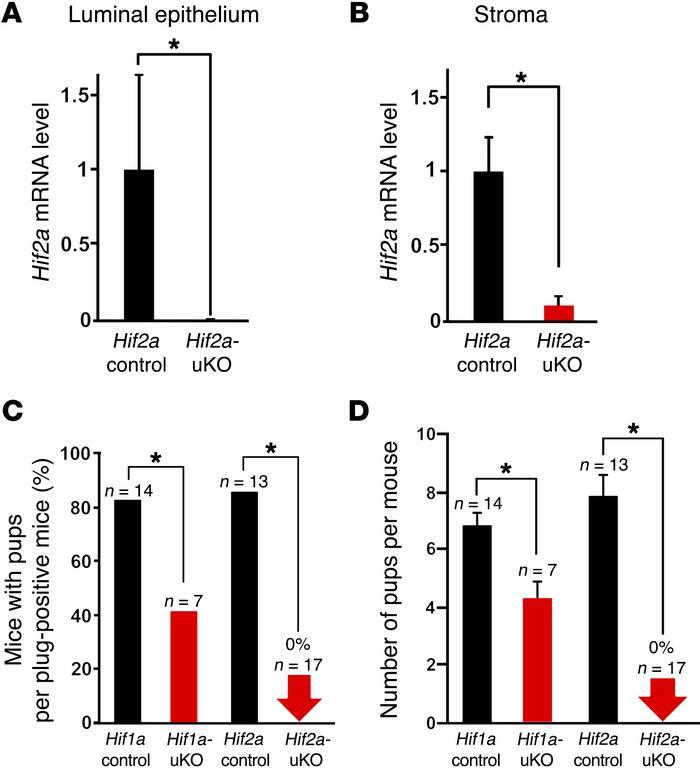 Hif2a-uKO mice show infertility, and Hif1a-uKO mice show subfertility. (A and B) Hif2a mRNA levels were reduced in the uterine luminal epithelium and stroma of Hif2a-uKO mice, respectively (n = 4). (C and D) Hif1a-uKO mice were subfertile, and Hif2a-uKO mice were infertile. Hif1a-uKO mice, Hif2a-uKO mice, and their littermate controls (Hif1a control, Hif2a control) were mated with WT fertile male mice. (A, B, D) Mean ± SEM, Student’s t test. (C) Fisher’s exact probability test. In all panels, *P < 0.05.